For the last two weeks i've had a significant issue with the car. It'd run lean and deeply limit my speed. 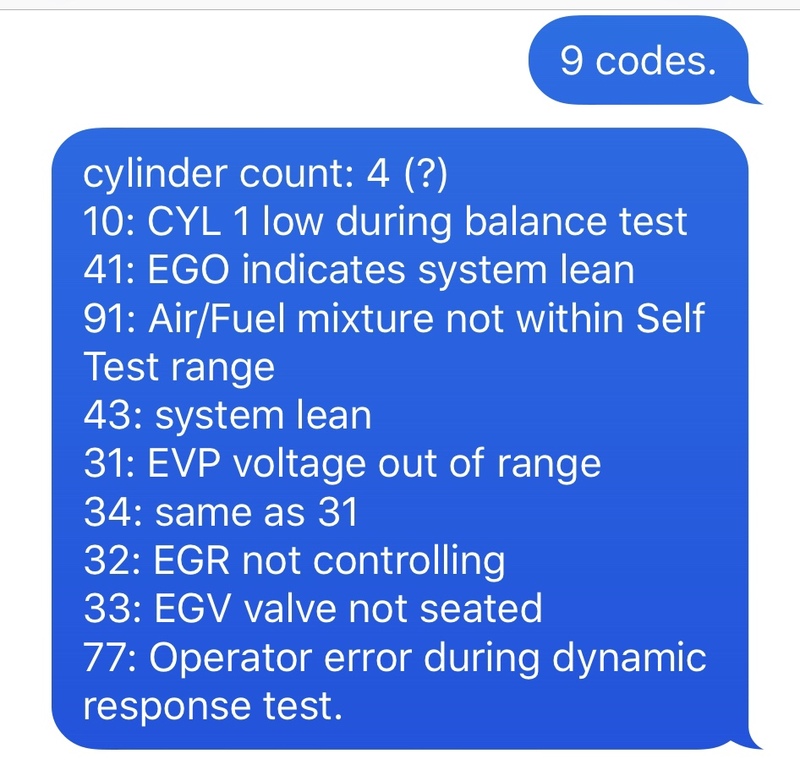 pulled codes twice: big ones were things to do with the EGR and cylinder 1 being low during the balance test. First thing was to clean the EGR... did that and may have forgotten to hook up the vacuum line going to the EGR. it seemed good for about an hour of driving to get to school. Car stalled out twice at two red lights due to a SUPER low idle. But that was the only issue for the most part that day. Only drove it to school and home that day, let it sit over the weekend. Sunday night, dad noticed I didn't hook up that vacuum line, hooked it up for my while we were adjusting my idle. Monday morning, I was driving to my vocational classes to take care of another small thing with the car and about three miles into the trip I went from 45 mph down to 30 almost immediately with no change in throttle input, at that point the car was warmed up. Turned around to get to my own school, couldn't get past 30 mph. My dad and I are stumped on this one. We haven't been able to figure this one out. by this I mean that we aren't looking to spending $80 to buy a new EGR just to drive the car for another week. So I understand it's way down on power but are you saying you think it would run fine to California as long as you stayed under 30MPH? How did you arrive at the theory that it "runs lean"? Does it idle at all? Does it start and run fine with your foot on the gas but then lose power when put in gear? Can you rev it up freely in neutral at all? You can use a piece of tin to block off the EGR for free. An EGR is not capable of making your car not be able to go over 30. A bad EGR will cause surging, poor idle, possibly off idle stumble etc. but you would be able to go as fast as you wanted. Last edited by homer302; 10-16-2018 at 06:58 PM. Pulled spark plugs last week. With what I know, those engines run on loops, it'll start and run fine until it gets up to temp when the ECM actually starts reading and adapting to what the sensors are telling it. I wouldn't trust it to drive all the way to California. Last week the idle would stumble in park, haven't noticed it at all this week. and here's your checklist: Starts fine cold without foot on gas, power loss in gear (will be checking trans fluid again in the morning), can rev freely in neutral. does tend to surge when i get to the speed it seems limited to. Your issues are the EXACT reason I am getting rid of the damn fuel injection system on my 86 convertible. That damn thing is the root of all my problems. good riddance to it!!!! little update: took it down the road and back after having it sit in my driveway for about a week, doesn't rev freely in neutral, seems to build a misfire at around 1500 rpm, can't get past 25 mph. Luckily i'm trying to get her in my school's auto shop for the winter so i can do my 5-speed swap in comfort, I've got a spare 3.8 coming my way soon and will probably start swapping parts if needed. I say that because anything that would make the cfi cause that problem would throw codes. there are the codes from my last check. yeah, but those codes don't make me think of the symptoms you are describing. If those were causing your issue, disconnecting the egr would actually fix them. although that last one might be important. And the odd cylinder count I don't understand but could imagine a coil or cap and rotor might influence. I ran the test twice, same codes. did disconnect the vacuum line going to the EGR and plugged it with something, didn't solve the problem. Coils are so cheap, give it a shot. Check that cap too, look to see if there is bad wear patterns on the contacts. Time to revive this thread as spring is rolling around the corner. I haven't given too much thought to the problem other than coils. Dad said he replaced all of the ignition components when he did the rear end swap and can't see that being the problem. We did have an ongoing loss of coolant shortly after replacing the radiator, did a system pressure test awhile ago and had coolant leaking from the top of the timing cover, but that's the only time i ever saw coolant leaking from there. I checked under the car everytime I parked and everytime I came back to it, only saw a puddle once, and it didn't appear to be coming from the timing cover. The engine was rebuilt about 28k miles ago, so I don't see how the bottom end spontaneously failed. tfi or distributor module? Also, with cars of this age, vacuum lines and electrical insulation can be very brittle/deteriorated causing vacuum leaks and electrical shorts. I mentioned all of this because my '86 LTD has suffered from all these things. It was dying randomly at stop signs/lights (at idle with brakes applied) and eventually wouldn't start at all. A used distributor from the j/y solved that. I have also repaired several vacuum lines and crumbling insulation. Good luck figuring it out. it started running real stupid , no power, and not shifting right. I found one of the plugs on the vacuum tree had rotted and split. 97k and no issues with the CFI. How old is the o2 sensor? how is the o2 sensor wiring? I think he may have been referring to the pickup coil in the distributor when he mentioned distributor module. I had an issue where my car would just stall going down the road. Once it sat and cooled down it would run fine for a while and then do it again. Replacing the ignition module had no effect. I wound up just replacing most/all of the ignition because the problem was very difficult to reproduce. Part of that was a new Motorcraft distributor with the aforementioned pickup coil. I cannot recall from your other posts what all you have done on the car to try to solve any other issues. i haven't done anything to the motor besides rebuild the TB and replace injectors. we had a short in the ECM and soldered wire to bypass that short, have an ECM on hand in case i need it though. This is what I put in my car. Dirt cheap for what it is in my opinion. something is pretty likely to only lead to frustration. You need to follow the data. could be a voltage supply problem, a grounding problem, or the main or in-tank lift pump may be failing. valve is not seating, you need to correct that condition. But the 31 code suggests that's not the issue. decrease to no less than 100Ω. At no point in the valve travel should the sensor resistance read open. ground issue. Most likely that would be the ECU ground pigtail connection on the negative battery cable. Does sound like the EGR is getting stuck open, but the EVP could be the culprit, I had that pair of valves on the drivers side fender apron get leaky and then would not control the EGR properly. My driveability issue with that never got this bad though.